What can be more romantic than a Valentine’s Day wedding? “I’d have to kiss you first before I can kiss you again.” The low intimate timbre of his tone sent a prickle over her, tightened her skin. Even from the distance of his desk that separated them, Riley noticed the way his gaze dipped to her mouth then darkened as she crunched the chalky sweet. “C’mere.” His voice, richer, darker, and sexier caressed her. “Why? Do you need me to look at something in that file you were reading?” She kept a playful smile in place as she thought of a way to ease out of yet another potentially awkward moment she’d created with Sam. She was pretty sure she’d make a fool of herself if she closed the space between them. “Riley.” Her insides liquefied whenever he said her name with such command. “Come here.” With that rusty edge to his usually smooth voice, she couldn’t help but obey. “Sam…” This time it came out breathy and needy. 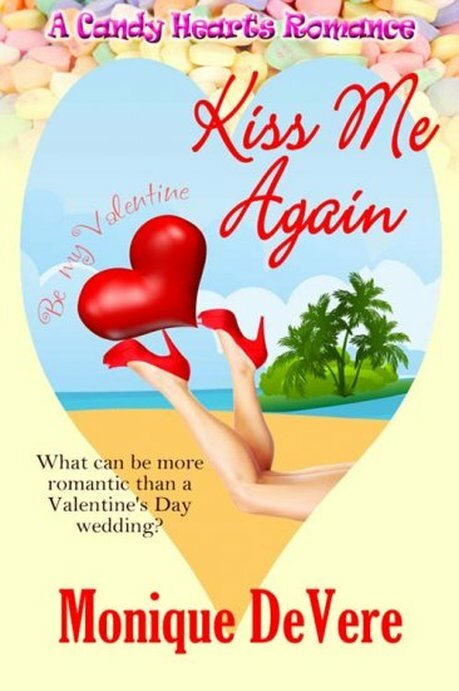 This entry was posted in Candy Hearts, Charlotte Copper, Romance and tagged Candy Hearts, Kiss Me Again, Monique DeVere, Office Romance, romantic comedy by Charlotte Copper. Bookmark the permalink. I love romantic comedies! Cute cover. Congrats on your upcoming release.